Strengthening, rejuvenating and unifying. 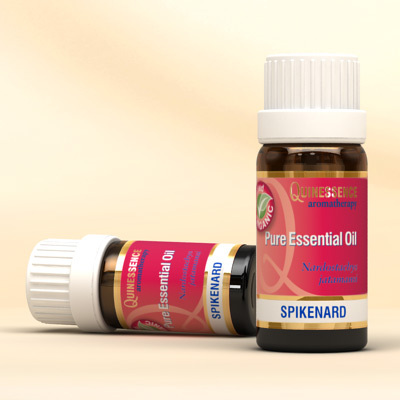 Spikenard Essential Oil was known in biblical times as Nard, and was used in religious ceremonies as it was believed to instill inner peace and nourish the soul. This essential oil is used in aromatherapy today to relax states of agitation and to rejuvenate dull, dry, and mature skin. It is also an effective oil to prevent premature ageing of the skin as well as soothing problem skin conditions. Spikenard Essential Oil helps to combat dandruff, and in 2011, researchers investigated the long held claim the spikenard oil helps to stimulate hair growth, and reported positive results that were encouraging. Spikenard essential oil has a complex green-mossy, slightly woody and earthy aroma with musky overtones, and also has nuances that are reminiscent of valerian oil (Valeriana officinalis). This is not surprising since it is a close relative of this species. Despite their botanical relationship, spikenard does possess therapeutic qualities that are different and its aroma is much more appealing than valerian. Spikenard oil is commonly used by women in India to perfume their hair. In 2011, researchers investigated the long held claim that spikenard oil helps to stimulate hair growth, and reported positive results that were encouraging. Spikenard oil was a precious commodity in ancient times, and originally reserved for kings, priests, and privileged esoteric apprentices in Egyptian, Hebrew, and Hindu cultures. It was also used for its wide range of healing medicinal properties in ointments, and eventually it became more freely available for use in common folk medicine. Spikenard oil is still recommended in the Ayurvedic tradition for nervous and spasmodic symptoms, such as heart palpitations, headache, shaking, and convulsions. It is believed to be especially beneficial as a sedative and for the treatment of digestive and respiratory system conditions. In Pakistan, spikenard is used in preparations to treat Bell's palsy, hemiplegia, and Parkinson's disease.